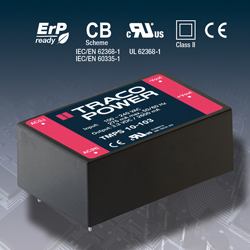 Traco Power has released their TMPS 10 series of 10W fully encapsulated PCB-mount power supplies that measure only 1.5″x 1″ x 0.62″ and needs no external components. The series provides seven single output models ranging 3.3-48Vout with the latest safety approvals for IT solutions (IEC/EN/UL 62368-1) and IEC/EN 60335-1 for IoT, building/home automation and industrial applications. Features include: peak currents of 130% for up to 30 seconds; -25C to +50C full-load convection-cooled operation (derate 2.5%/K above 50C up to 70C); Class II Prepared (no safety ground required); no load power consumption of <0.15W (ErP Ready); and EMI that satisfies EN 55032 class B and EN 55014-1. Compliance to the ErP directive for no load power consumption, 130% peak load capability and safety approvals make these excellent solutions for standby power circuits and a broad variety of industrial and commercial applications where low power and a small footprint are needed.